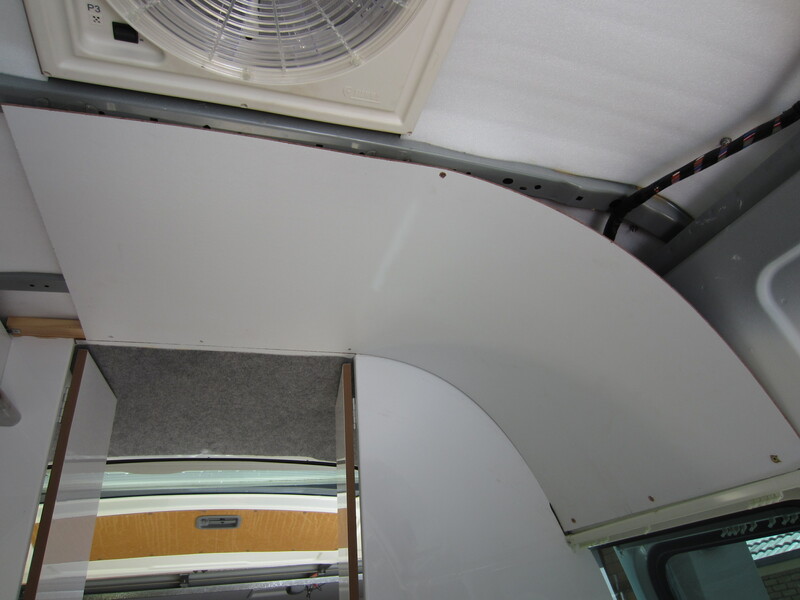 Early on in our diy campervan project, Paul removed the back panel of the internal ceiling so he could install the wiring. (The front panel stretched right down to the windscreen and housed all the air conditioning, so he left this intact.) Removing the ceiling afforded us an extra 10cm head height in the main part of the van, which has been useful with Paul working in there every weekend, and which we’re now reluctant to lose! 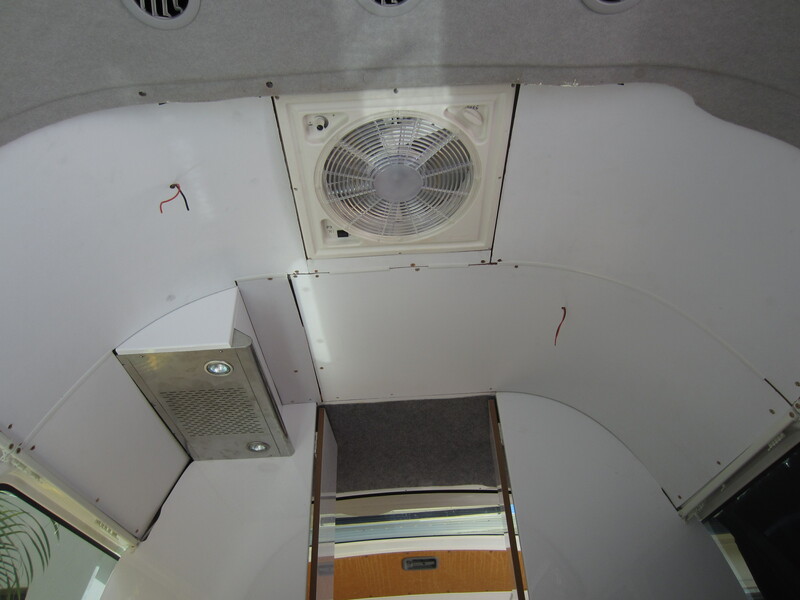 So instead of replacing the original ceiling, Paul’s created a new one out of panels of flexible hard board. 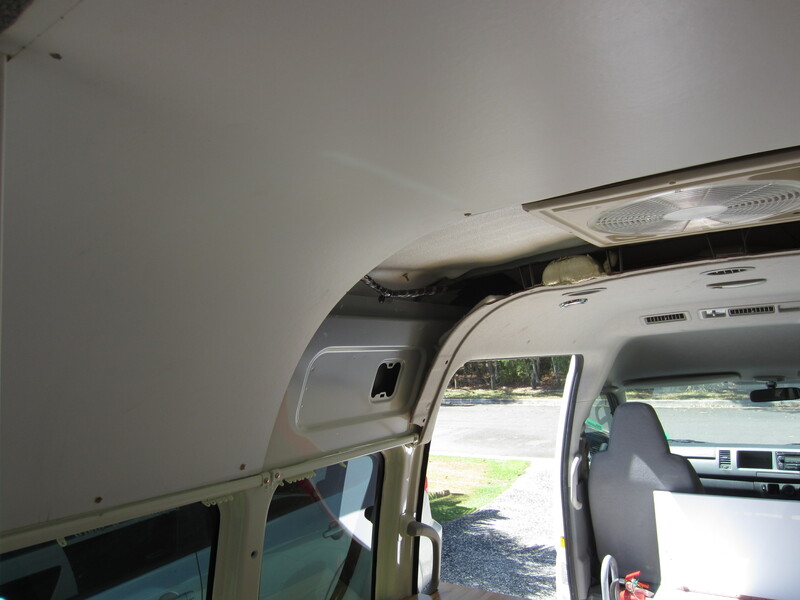 Once all the ceiling was insulated (using flooring insulation as above), the hard board panels could go up. 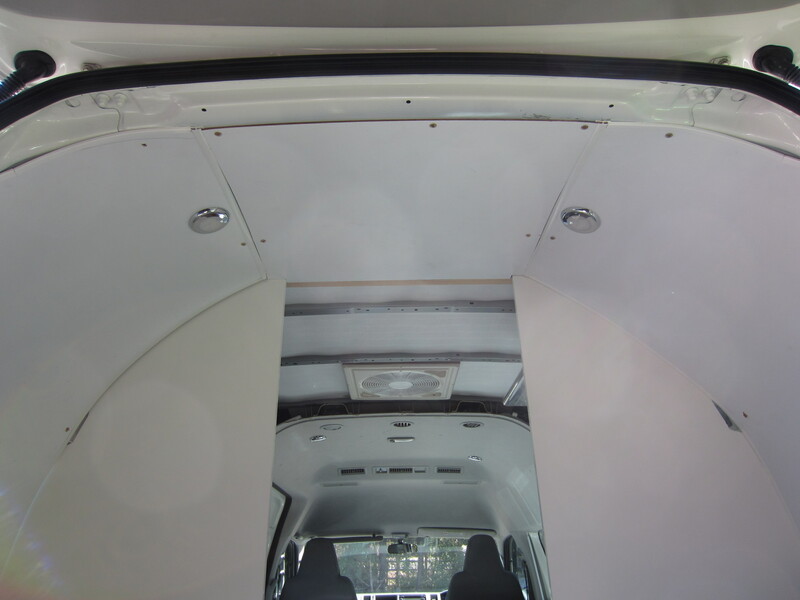 It was quite a long process involving a lot of measuring and sawing, before each panel was screwed into the van framework with metal screws. The original ceiling is covered with a pale grey type of carpet, which we couldn’t match exactly so we’ve gone for a two-tone look with a darker grey carpet matting from Clark Rubber. It was really fiddly cutting the carpet template exactly to size and fitting it in place – made harder by the fact that the adhesive (Selleys Kwik Grip spray) was brilliantly sticky and stuck fast the instant it attached to something. The wiring for each hole was fed through the board and the carpet, then the light fitting screwed on top. 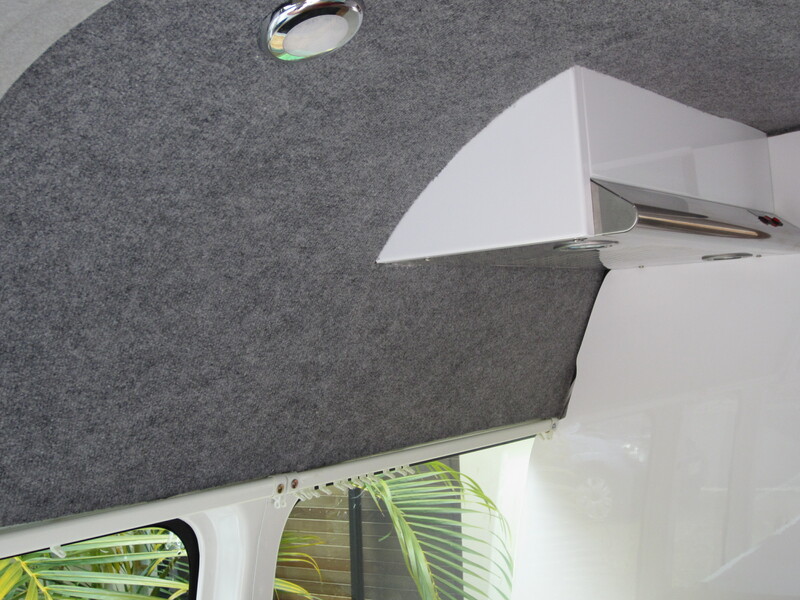 The final job is to bridge the 10cm gap between the front panel and back panel. It’s great having the tiny bit of extra room, and we’ve realised we don’t even have to stoop over any more, if we just bend our knees into a slight squat we can stand up to full height – a quick and simple way to combine a bit of added exercise with excellent health & safety practice. 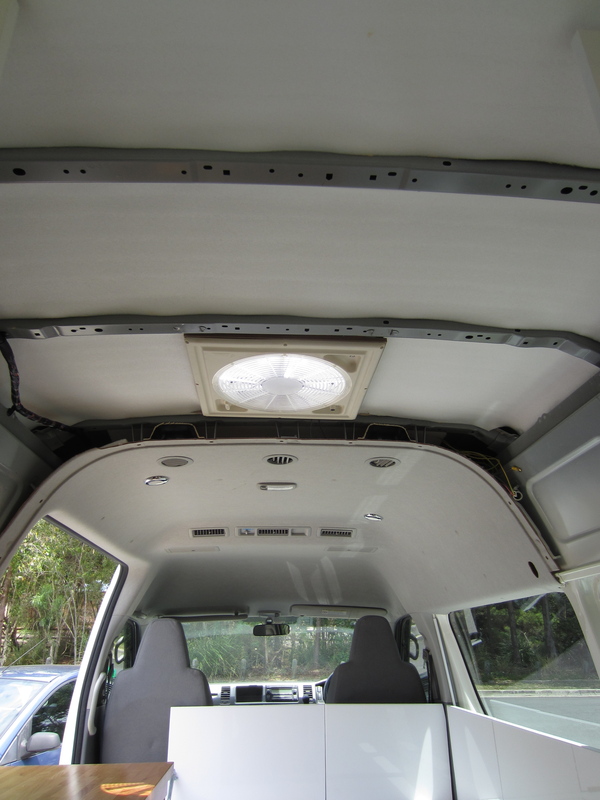 This entry was posted in Building a diy campervan, Camper ceiling and tagged building a campervan, campervan bathroom, Campervan photos, Converting a campervan step-by-step, DIY campervan, raising campervan ceiling height by Rach. Bookmark the permalink. 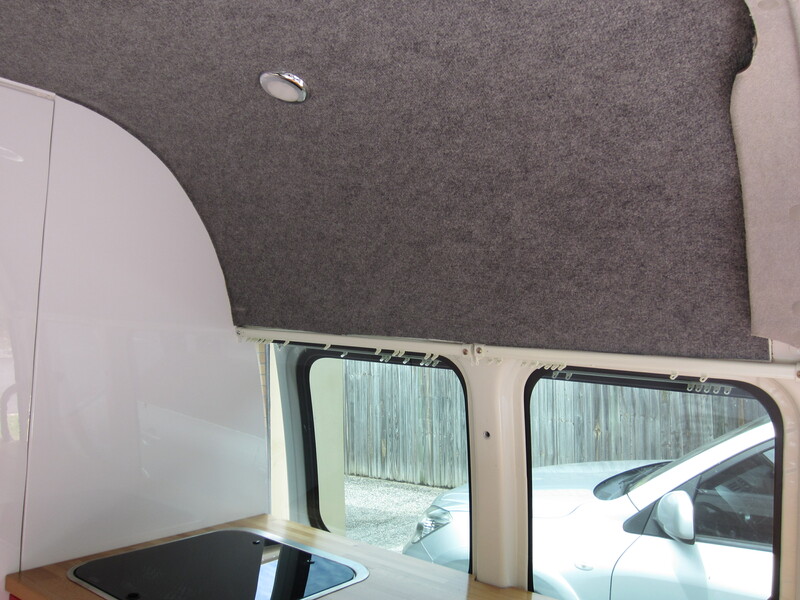 I am surprised at my own interest in the detail of vehicular refurbishment but even more curious how you and your camper an will fare on your inaugural trip. And having described its birth in so much detail how will you feel when the van replaces you as the main attraction for a visit to Australia in the future! I am quite happy to play second fiddle to the van when people come to visit! So start planning your next trip! Great blog. I am waiting for a new Renault Trafic to be delivered. 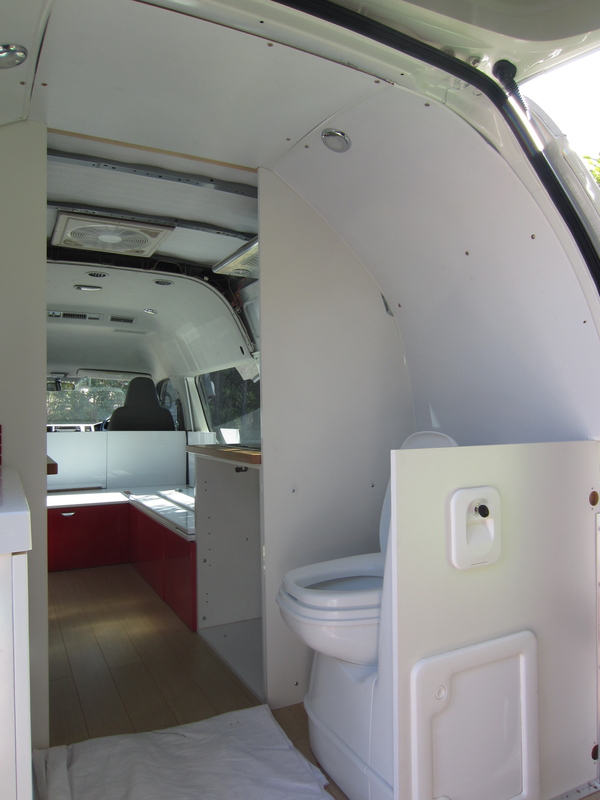 What is the make of your van? Thanks DutchAussie! It’s a Toyota Hiace Commuter – SLWB. It’s a great vehicle!